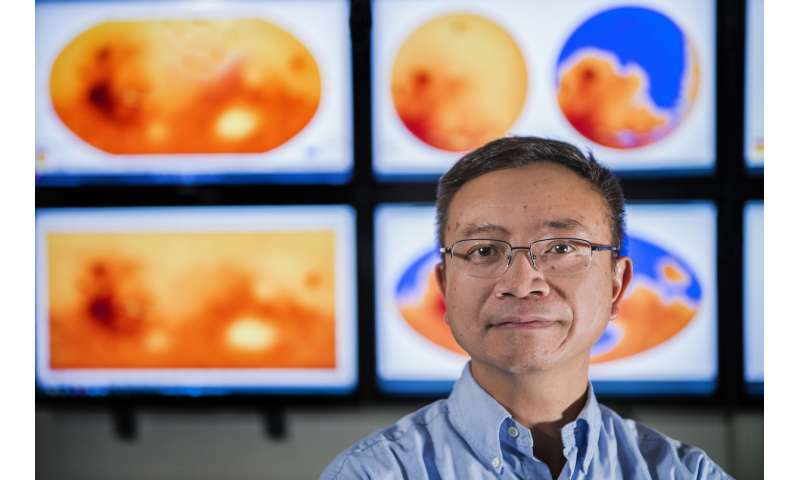 A new study led by Northern Illinois University geography professor Wei Luo calculates the amount of water needed to carve the ancient network of valleys on Mars and concludes the Red Planet's surface was once much more watery than previously thought. The study bolsters the idea that Mars once had a warmer climate and active hydrologic cycle, with water evaporating from an ancient ocean, returning to the surface as rainfall and eroding the planet's extensive network of valleys. Satellites orbiting Mars and rovers on its surface have provided scientists with convincing evidence that water helped shape the planet's landscape billions of years ago. But questions have lingered over how much water actually flowed on the planet, and the ocean hypothesis has been hotly debated. "Our most conservative estimates of the global volume of the Martian valley networks and the cumulative amount of water needed to carve those valleys are at least 10 times greater than most previous estimates," Luo said. "That means water must have recycled through the valley systems on Mars many times, and a large open body of water or ocean is needed to facilitate such active cycling," Luo said. "I would imagine early Mars as being similar to what we have on Earth—with an ocean, lakes, running rivers and rainfall." 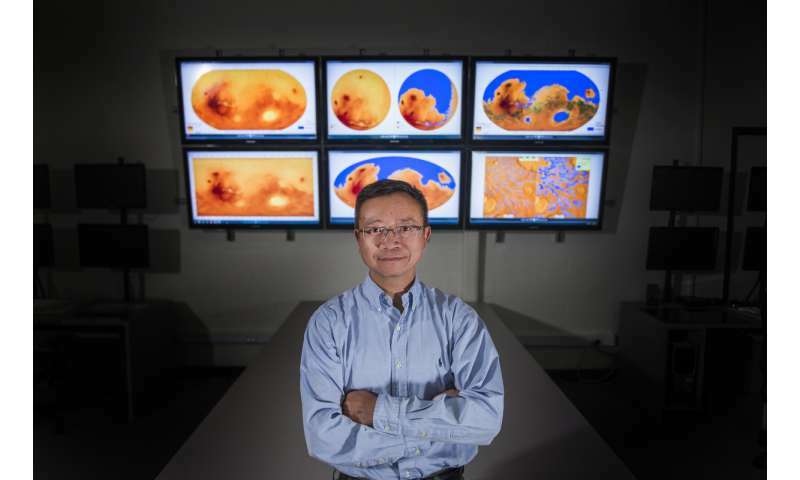 "Mars is much farther way from the sun than Earth, and when the sun was younger, it was not as bright as it is today," Luo said. "So there's still a lot to work out in trying to reconcile the evidence for more water." To determine the volume of Mars' valley networks globally, the scientists developed computer algorithms, based on those used in terrestrial laser-generated data analyses with very high resolution. They applied the algorithms to the digital elevation model data, estimating the depth of all the Mars' valleys at pixel level. "The increase in the estimated volume of valley erosion in this study primarily results from taking into account the incision of the many small tributaries draining into the main valleys," co-author Howard said. Maybe young Mars also had a magnetic field and a thick atmosphere that was much better at retaining heat. Maybe there are signs of early magnetism into the rocks there and of tectonic plates (which may point to the early existence of water). Maybe you should Google your notions to find out if they are novel or not? "It is thought that the localized fields detected on Mars are remnants of a magnetosphere that collapsed early in its history. " 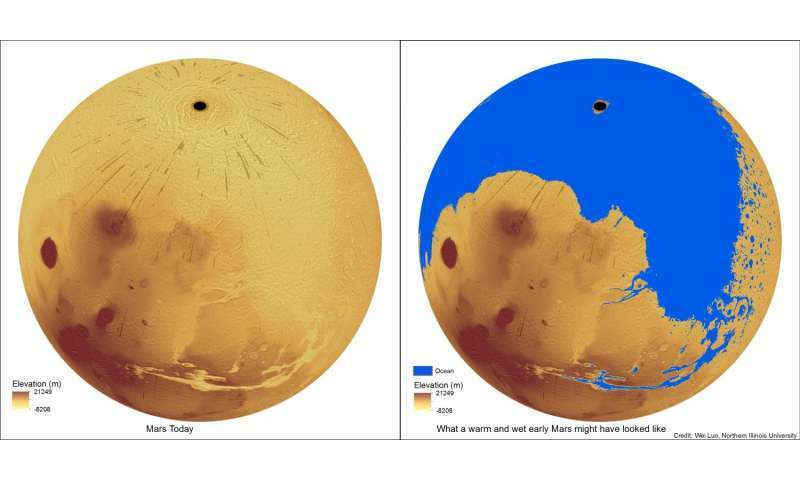 Plasma arcing in Mars early history has been proposed as a creator of the Valles Marianas and there has been hints at the production of water from plasma arcing. Here theorists have proposed that mountains have been created by deposition from above. Again from plasma arcing. About the time of the Hellas and Utopia impacts. Or Galactic Unicorn farts.. don't forget those. "Our most conservative estimates of the global volume of the Martian valley networks and the cumulative amount of water needed to carve those valleys are at least 10 times greater than most previous estimates,"
Uff-da, that's quite a bit. Doesn't stop the acolytes such as jonesdumb from calling it a done deal though. climate models have not been able to reproduce an early Mars climate sufficiently warm enough to promote an active hydrologic cycle. "So there's still a lot to work out in trying to reconcile the evidence for more water." No problem there, just blame it on something "dark". The young Sun was "dark" hot. Yep. That's a good suggestion. You mock the electro-universe theory, yet surely you know that Unicorn farts are one of the most destructive forces of nature on other planets. Able to level mountains and even crack the crust down to the mantle on smaller orbs, they most definitely could be responsible. Well at least lend a hand to the diabolical, plasma arcs which seemed to have ceased to exist in any way shape or form that is detectable by modern science. No doubt they share with the unicorn the trait of disappearing completely while they do their work and leaving only the results behind to confound the traditional theorists and inspire the faithful. I think the canyons on Mars were caused by an electro-static discharge during a near miss. The interaction between the electromagnetic fields of two closely passing planes would function like a pair of Tesla coils. I think the canyons on Mars were caused by an electro-static discharge during a near miss. Well then, where's the "near miss" in it? Anyway, one should establish clear consequences of an electrostatic discharge having that sort of effect as compared to some tectonic or hydrological events, so that one can clearly deduce from measurements which kind of event really took place and which one did not. Otherwise it looks like speculation.